Come join us on the first KVBC ride of the season! On Saturday, April 18th, at 10:00 AM we will meet at the parking lot of the Manchester Elementary School on Rt. 17 just past the junction with Rt. 202 (next to the fire station). We will ride the back roads, about 23 miles, to Wings Mills and back. This will be a leisurely group ride with a few good hills to get everyone into the swing of things. 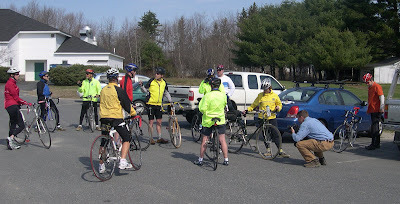 Last year the ride fell on Earth Day and we had a nice turnout - even a local photographer from the Kennebec Journal. I will post some ride maps and more photos in the week ahead. Mark your calendars - the first KVBC ride is little more than a week away!